A couple of weekends ago I did a rather lovely cooking day at the Jane Austen House Museum. For once, the sun was shining, the kitchen had decent windows (one of which even opened – which was good, for there was a fire alarm sensor in the kitchen), and even though I was in Regency costume and it flatters no-one, I cooked nice things and nothing went wrong. (Apart from slicing my thumb open, but hey). I had to come up with a set of dishes which were cookable in 4 hours, on an electric hob and very small oven, and which would be representative of the kind of thing Jane, her sister Cassandra, her mother and friend Martha Lloyd would have been eating in c.1810, when they were resident in Chawton at the JAH Museum. They employed a series of cooks, all women as you’d expect, with varying degrees of success, so it had to be food which could be cooked easily by one person. I had various sources upon which to draw. Martha kept a manuscript recipe book. Jane occasionally references food in her fiction and her letters. The kitchen and outbuildings have surviving fixtures and fittings which indicate the kind of foods which could be bought, stored and prepped. And, of course, there are the usual printed books of their day, including Maria Rundell’s New System (1806 and subsequent), the success of which enabled her publisher, John Murray, to take a punt on the then unknown Jane Austen. As would have been the norm for a household of that type, I opted for a simple one-course à la Française meal with one remove. This would have been dinner, served there probably around 4pm. When dining with her brother at Chawton House, up the road, dinner would probably have been a tad later, around 6pm, and he might even have opted for the newcomer on the meal scene: lunch. My menu was roughly based on the formats in Charlotte Mason’s Ladies’ Assistant, but with dishes taken from the letters, and Martha’s book, plus what was in season in the 18th century in late March (sometimes rather different to today, as more was produced in the UK, using advanced forcing techniques to rather play with the seasons). I also wanted to select dishes to highlight different themes in 18th century cooking and provoke questions from the expected hordes of visitors. 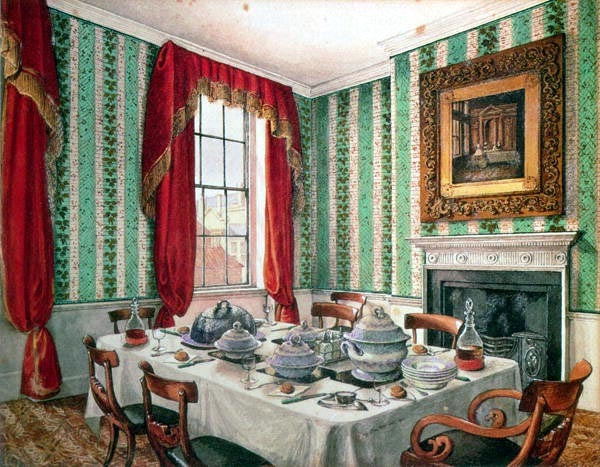 Our Dining Room at York, by Mary Ellen Best (1838). I did a bit of a magpie job on the recipes. 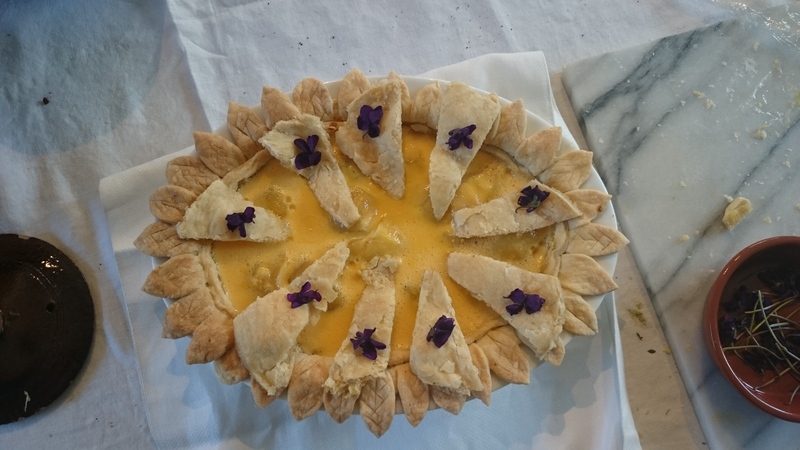 The apple pie was from Simpson’s Complete System (1816), the curry from Martha Lloyd’s handwritten recipe book, ditto (sort of – I’ve done it before and played with it) the soup, and the fricassée. The spinach is from Moxon’s English Huswifery (1758) and I picked it for her very clear presentation instructions. Inevitably, I didn’t quite complete all of them, but they served their purpose in getting people thinking, talking, and asking for the recipes to take home. The surprise winner was the curry – amazingly simple, but absolutely delicious. I later tweeted the recipe, and the general consensus was that it was effectively butter chicken, with added gloopy sauce. See what you think – I’ll put basic instructions below. The menu was very balanced, and very spring-like. People talk nonsense sometimes about lack of vegetables on the tables in the past – certainly not the case here (or at all). Any leftovers would have been recycled into supper dishes the next day (mine were recycled into my lunches for the rest of the week). And it would have been doable in 4 hours, apart from the finger incident. On the plus side – I’ve learnt I can make excellent pastry with my left hand. *Sigh*. Apple Pie. The recipe calls for you to remove the top, cut it into chunks and place them around the apples. I’m not completely convinced mine is exactly a work of art, but it tasted good. 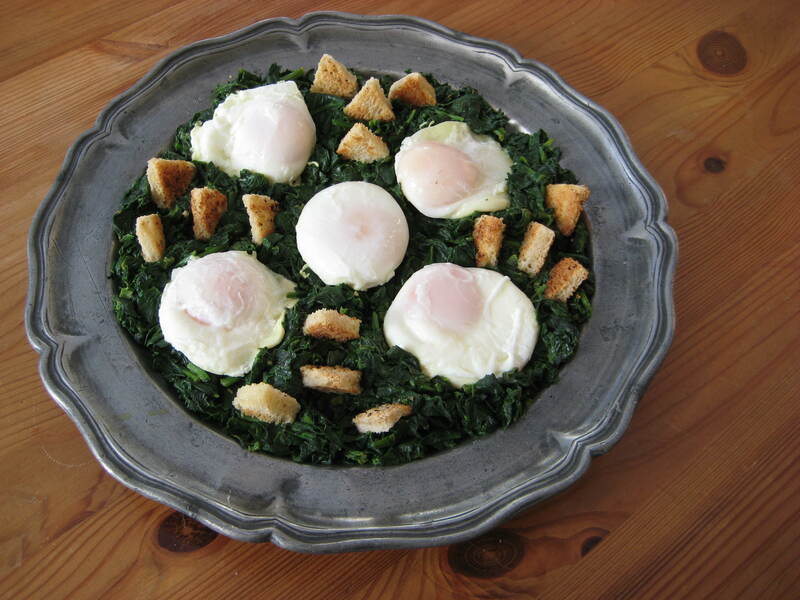 Spinnage and Eggs, with sippets of bread. Nuff said. Chicken Curry, based on Martha Lloyd’s ms. recipe book. Joint a chicken and poach it in lightly salted water (yes, the recipe was probably designed to use up an old layer). Drain, keeping the liquid. Melt 8oz of butter and heat until beurre noisette (mildly brown). Reduce the heat and throw in 2 cloves of garlic and an onion, diced finely. Allow to cook gently (you’re basically making a confit). Add the chicken and 2-3tbsp curry powder. Stir, Add enough of the boiling liquid to make a sauce and heat through until thick – and properly cooked. Serve with lemon pickle or a wedge of lemon or orange. Curry powder – 1/2 oz each galangal, turmeric; 1/4 oz cayenne pepper; 2 oz rice flour. (If you can’t get galagal powder, because apparently ‘it’s better fresh’, then use ginger). < Previous Let’s have a (1950s) party! Sounds yummy! I want to try the chicken curry.